(left to right): George Moore, Place 7; Ernie Cochran, Place 4; Anne Farris, Place 3; and Derrick McGary, Place 1. Texarkana, TX– At Texarkana College’s Board of Trustees meeting today, four Trustees were sworn in to office to serve another term. 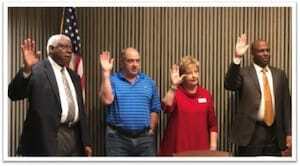 Derrick McGary, Place 1; Anne Farris, Place 3; Ernie Cochran, Place 4; and George Moore, Place 7, all ran unopposed in the election held in November 2018. President James Henry Russell said TC has a strong group of leaders serving as Trustees and their dedication to ensuring student success is unwavering. Russell said serving as president over the last seven years has been an honor and a time in his life he will never forget. In other business, Kim Jones, TC’s chief financial officer, reported on the College’s audit for 2017-2018 fiscal year ending August 31, 2018. Jones said the independent audit, conducted by Thomas and Thomas Certified Public Accountants, resulted in a completely clean audit with zero findings. The 2017 beginning of the year net position was restated as required by the implementation of GASB 75, Accounting and Financial Reporting for Postemployment Benefits Other than Pensions (OPEB). The mandate requires all public college and school districts to reflect a portion of the state’s unfunded ERS health insurance benefit liability on their financial statements. Texarkana College’s portion is .075 percent of the state’s liability resulting in a cumulative effect of change in accounting principle of approximately $30 million in beginning net position. TC Board President Kyle Davis said the audit report shows campus-wide commitment to maintaining excellence in fiscal management and controls while maintaining a safe and secure learning environment for students. Davis said over the last seven years, TC has been able to maintain one of the lowest tax rates in the entire state, balance an unstable budget and have clean audits year after year. The Trustees also heard an update from President Russell on the proposed plan to address remaining critical deferred maintenance and repairs around campus. Russell said there are still numerous issues that amount to a conservative estimate of $15 million to upgrade and renovate facilities to meet state and federal ADA compliance standards and modernize instructional space. Russell said a team of architects and engineers inspected the campus for necessary maintenance and repairs to determine the scope of needed funds. The TC Board of Trustees reviewed the detailed report from the architect and engineers at their November meeting. Russell said it is anticipated that construction projects can be completed over the next four years. Incoming TC President Dr. Jason Smith, TC board members, faculty and staff will begin working with architects and engineers during the spring semester to finalize plans for construction. Russell said that by utilizing maintenance tax notes to fund the projects, TC’s tax rate would still remain one of the lowest in East Texas and 20 percent lower than the state’s average. Texarkana College will utilize a combination of unencumbered general fund reserves and future tax revenue to fund the payback of the notes over a 20-year period. Texarkana College will secure financing for capital improvements through Farmers Bank and Trust which has provided the College with the most advantageous interest rate. Financing documents will reflect the interest rates and other terms that Farmers provided in its November 30, 2018 response to the College’s request for financing proposals. Board review and approval of these documents is expected in February 2019. April 11, 2019- Texarkana Aluminum donated $5,000 to Texarkana College to be awarded to area high school students who are pursing workforce dual credit classes. “Engaging the future workforce in mechanical and electrical engineering learning is of great importance to Texarkana Aluminum,” said Amy Bowers, Community Outreach and Internship Manager. -Texarkana College Trustees learned at their board meeting today that TC has the highest 3-year full-time student graduation rate of all 50 community colleges in Texas. The Texas Higher Education Coordinating Board (THECB) released the information earlier this month as part of an annual statewide accountability report.